Your kidneys are two bean shaped organs in the back of your abdominal cavity on either side of your spine. Like many other organs in your body, the kidneys can develop cancer. In adults, the most common kidney cancer is Renal Cell Carcinoma. The second most common kidney cancer is Transitional Cell Carcinoma. The American Cancer Society estimates that >50,000 Americans will be diagnosed with kidney cancer each year. Renal Cell Carcinoma has few or no symptoms in its early stages. In later stages, it can cause upper back pain, blood in the urine, weight loss and fatigue. Typically, kidney cancer is diagnosed “by accident”. Most cancers are detected on radiologic studies that are ordered for completely unrelated issues. Luckily, when these cancers are found in their early stages, cure rates with treatment are >80-90%. Laparoscopic Radical Nephrectomy : complete removal of the entire kidney through small telescopic incisions in your abdomen. 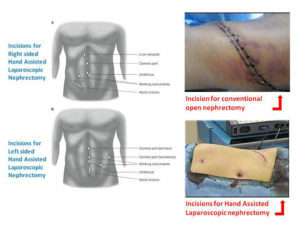 Open Radical Nephrectomy: complete removal of the entire kidney through an incision, either through the abdomen or flank. 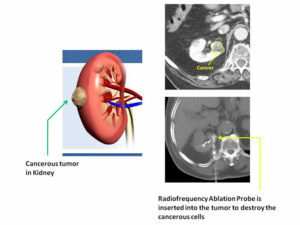 Cryotherapy or Radiofrequency Ablation (RFA): In a laparoscopic procedure, the tumor on the kidney is exposed and small probes are inserted into the tumor, these probes freeze or burn the tumor to destroy the tumor cells. Typically patients can leave the hospital the following day. Tumor Embolization: Indicated for those patients who cannot tolerate surgery and are having active symptoms. Through a small catheter in the groin the blood and oxygen supply to the tumor is cut off, thereby shrinking the tumor and reducing symptoms such as blood in the urine and back pain. Your kidneys are two bean shaped organs in the back of your abdominal cavity on either side of your spine. Kidney cysts are extremely common and can be found in up to 80% of the population. 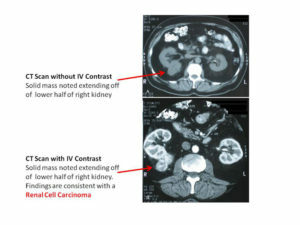 Many patients are found to have kidney cysts after undergoing imaging for another condition. Kidney or renal cysts are classified into simple and complex. 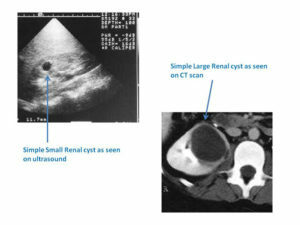 The majority of patients have simple renal cysts. A smaller proportion of patients have complex renal cysts that may require further testing to differentiate the cyst from a kidney cancer. 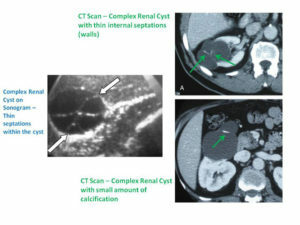 Kidney cysts are typically diagnosed by ultrasound, computerized tomography (CT Scan) or magnetic resonance imaging (MRI). For the most part it is very easy to distinguish a simple renal cyst from a complex one on these tests. Occasionally, it is necessary to order a second radiologic test to definitely determine the cyst’s characteristics. In general simple renal cysts are asymptomatic and require absolutely no further testing. They do not progress into cancers. For those patients with complex renal cysts Consultants in Urology can provide accurate testing and treatment options. These cysts do need further evaluation to ensure they are not cancerous.